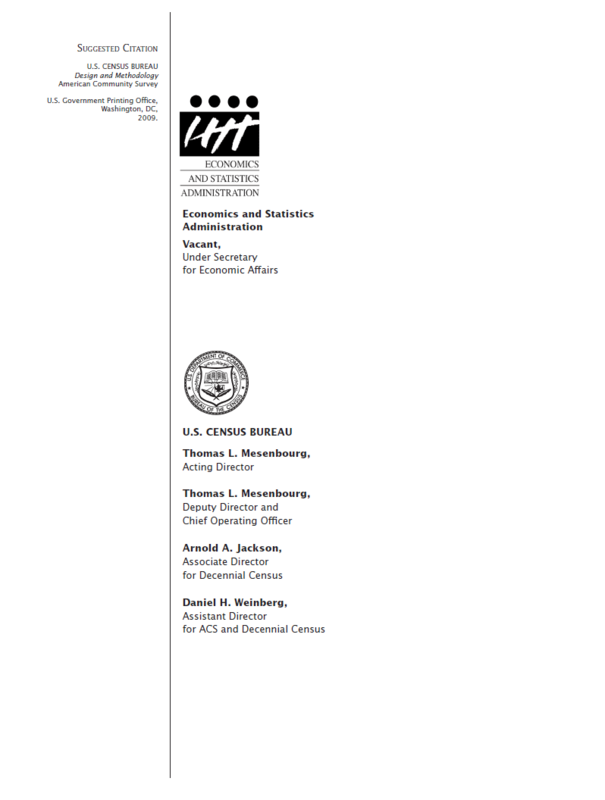 The updating of the May 2006 unedited version of this technical report was conducted under the direction of Susan Schechter, Chief, American Community Survey Office. Deborah H. Griffin, Special Assistant to the Chief, American Community Survey Office, provided overall management and coordination. The American Community Survey program is under the direction of Arnold A. Jackson, Associate Director for Decennial Census, and Daniel H. Weinberg, Assistant Director for American Community Survey and Decennial Census. 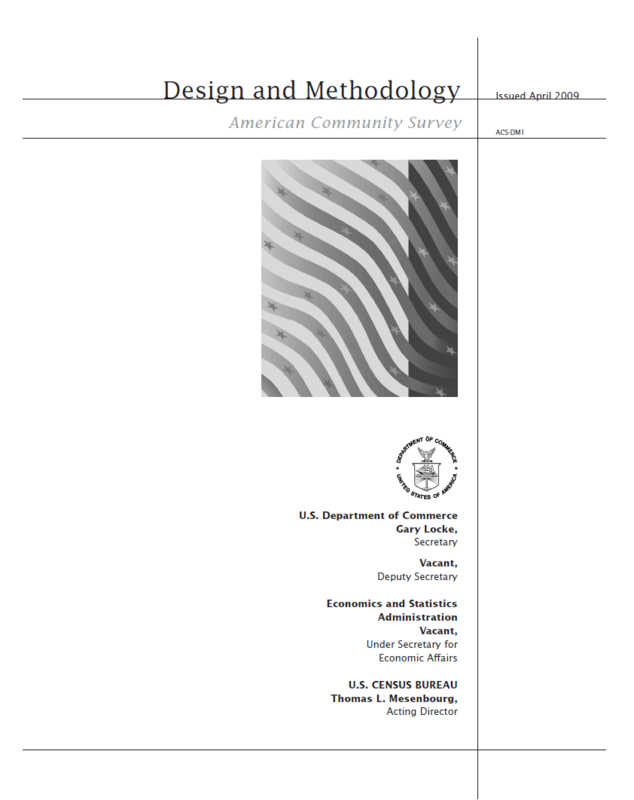 Major contributing authors for this updated 2008 report include Herman A. Alvarado, Mark E. Asiala, Lawrence M. Bates, Judy G. Belton, Grace L. Clemons, Kenneth B. Dawson, Deborah H. Griffin, James E. Hartman, Steven P. Hefter, Douglas W. Hillmer, Jennifer L. Holland, Cynthia Davis Hollingsworth, Todd R. Hughes, Karen E. King, Debra L. U. Klein, Pamela M. Klein, Alfredo Navarro, Susan Schechter, Nicholas M. Spanos, John G. Stiller, Anthony G. Tersine, Jr., Nancy K. Torrieri, Kai T. Wu, and Matthew A. Zimolzak . The U. S. Census Bureau is also grateful to staff from Mathematica Policy Research, Inc., who provided valuable comments and revisions to an earlier draft of this report. Assisting in the production of this report were Cheryl V. Chambers, Destiny D. Cusick, Susan L. Hostetter, Clive Richmond, and Sue Wood . The May 2006 unedited version was produced through the efforts of a number of individuals, primarily Mark E. Asiala, Lisa Blumerman, Sharon K. Boyer, Maryann M. Chapin, Thomas M. Coughlin, Barbara N. Diskin, Donald P. Fischer, Brian Gregory, Deborah H. Griffin, Wendy Davis Hicks, Douglas W. Hillmer, David L. Hubble, Agnes Kee, Susan P. Love, Lawrence McGinn, Marc Meyer, Alfredo Navarro, Joan B. Peacock, David Raglin, Nicholas M. Spanos, and Lynn Weidman. Catherine M. Raymond, Christine E. Geter, Crystal Wade, and Linda Chen, of the Administrative and Customer Services Division (ACSD), Francis Grailand Hall, Chief, provided publications and printing management, graphics design and composition, and editorial review for the print and electronic media. Claudette E. Bennett, Assistant Division Chief, and Wanda Cevis, Chief, Publications Services Branch, provided general direction and production management.